Mein Kampf is Rated 9+? Now I have never read the book “Mein Kampf” by Adolf Hitler but the first thing that hit me when reading this article on TechCrunch was that the screen shot showed that the book was rated for ages 9+! To start with, are there seriously any 9 year olds with an iPhone? If there are then there are some serious problems in society; why on earth would a 9 year old require an iPhone? My second issue was that, from what I have heard about the contents of Mein Kampf, there are strong anti-semitist views which I would not deem acceptable for a 9 year old to be viewing! I don’t know if you agree, but that’s just my point of view on this. 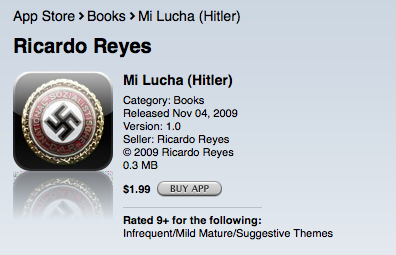 Mein Kamf is suitable for those aged 9+?